When staying in Paris for few days, most of you will have a trip to Versailles castle with kids, to enjoy castle and gardens visit. Few steps away, have a break in Monument Café, cafe who claims to be “cafe for families, travelers and curious ones”, that is fully true! 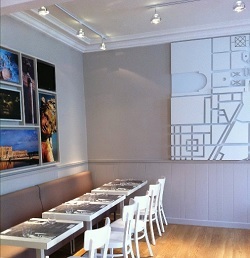 A spacious soft-designed café, offering several self-service menus for lunch and snack. Its decoration is made of pictures of the castle and gardens, completed with a mural interactive model map. And to welcome families this café is equipped with high chair, changing facilities and kid-toilets. The staff also organizes city tours for everyone, in French or English. Just because we had many times parents asking us how to manage in restaurants in Paris with their children when restaurants are not equipped with highchairs, we’ve added this travel seat to our range of baby equipment rental catalog. Planing a trip to Paris with young kids? You usually do not need a travel chair? Add the Baby To Love seat to your baby equipment rental, we’ll deliver it to your holidays rental in Paris and you’ll be able to enjoy any cafes and restaurants with your toddler. This seat is suitable for children who can seat unsupported and for a maximum weight of 16 kgs. This seat is designed to adapt to any standard chair and can be installed in few seconds only. See baby seat details and/or book it here.